The American Cancer Society has pushed back the age at which most women should begin having mammograms to 45. 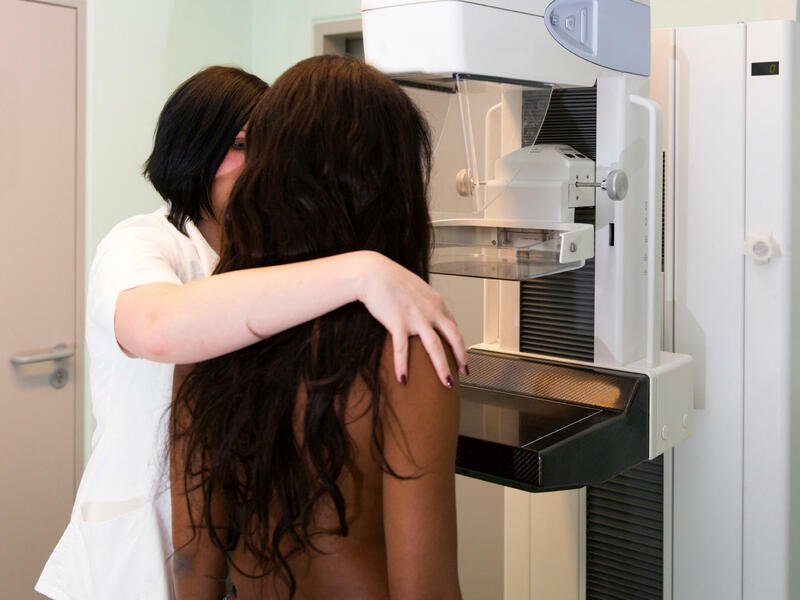 Most women don't need to start getting an annual mammogram to screen for breast cancer until they turn 45, according to the latest guidelines from the American Cancer Society. The guidelines "can result in a dramatic reduction" in the risk of breast cancer, says Richard Wender, the society's chief cancer control officer. He says that's because they focus on screening women who are most likely to benefit. The other major change in the society's guidelines: Doctors are no longer being advised to start breast exams annually at age 40. That recommendation is based on evidence that these exams provide little benefit and that a doctor's time could be better used for other things, such as discussing ways women can reduce their risk for breast cancer, the society says. The changes are published in JAMA, the Journal of the American Medical Association, and represent the first revision of the group's guidelines since 2003. The 2009 recommendation triggered one of the most intense debates ever in womens' health, in part because the cancer society, until now, continued to back annual screening beginning at age 40. Wender stressed that the society isn't recommending against women getting mammograms every year when they turn 40 if they decide that is their preference after discussing the pros and cons with their doctor. "There really is not a single answer to the question: Should I have a mammogram?" says Nancy Keating, a professor of health care policy at Harvard Medical School and a physician at the Brigham & Women's Hospital. But it doesn't look like the new guidelines will end the debate. The American College of Radiology and the Society of Breast Imaging, for example, still recommend annual mammography beginning at age 40. Later, less frequent screening could be risky, they say. "I am personally concerned as a woman and as a person heavily involved in breast cancer screening [that] there will be lives that we could save that will be lost," says Dr. Debra Monticciolo, a professor of radiology at Texas A&M Health Science Center College of Medicine. She chairs the radiology college's commission on breast imaging. The U.S. Preventive Services Task Force recently released a draft update of its guidelines that essentially reaffirms its 2009 recommendations. But the group will examine the cancer society's new guidelines and the research supporting them as it finalizes the guidelines, says Dr. David Grossman of the Group Health Research Institute in Seattle, the task force vice chairman. And we start this hour with the big news today about breast cancer screening. For the first time in more than a decade, the American Cancer Society is changing its advice to women and their doctors about mammography. The society's pulling back on how soon most women should start getting annual mammograms and how long they have to keep getting them. SHAPIRO: In a moment, we will talk with a doctor about this change. First, NPR health correspondent Rob Stein explains what prompted it. ROB STEIN, BYLINE: Breast cancer is the second most common cancer to hit women after skin cancer, and for years, according to Nancy Keating of Harvard Medical School, doctors told women there was one big thing they could do to avoid dying from breast cancer. NANCY KEATING: Most recommendations suggested annual mammography starting at age 40. STEIN: Getting breast x-rays every year could catch cancer early, giving women their best shot at beating it. But then a bombshell hit in 2009. Some really important experts basically said, maybe not. KEATING: The United States Preventive Services Task Force suggested every other year mammography for women starting at age 50. STEIN: Most women would wait a whole decade longer before starting mammograms and could even skip it every other year. Why? Well, the task force concluded it just wasn't worth it. Too many women get totally freaked out by false alarms, get radiation and lumpectomies, even, sometimes, mastectomies for what turns out to be nothing. KEATING: So women go through cancer treatments that they didn't actually need, all of which can be harmful. STEIN: That set off one of the most intense debates in the history of women's health. Both sides accuse the other of giving women dangerously bad advice. But today, the American Cancer Society announced it too has decided a lot of women can wait longer before starting mammograms. Richard Wender's the Society's chief cancer control officer. RICHARD WENDER: We now recommend that women begin routine mammography at age 45 and that they be screened every year starting at that age. STEIN: So the Cancer Society's kind of going half way. Instead of starting at 40, the average woman can wait until she turns 45. And that's not all. She only has to do it every year until she's 54. After that, she can start getting a mammogram every other year. WENDER: This is a far more tailored guideline than's ever been published before for breast cancer that essentially draws a roadmap of how a woman should think about screening through her lifetime. STEIN: Why all the changes? Wender says the Society came around to the idea that there are some real downsides to screening millions of healthy women every year when they're so young and their risk is so low. WENDER: Today, screening guidelines are expected to judge the balance between benefits and harms. And that was actually not a standard approach in 2003, which was a time when virtually all of the emphasis was only on the potential benefits of screening. STEIN: Now, the Society isn't saying women can't start mammograms every year when they turn 40. They can, and many should, especially if they have reason to be worried because maybe their mother or sister or cousin had breast cancer. Wender says each woman needs to talk to her doctor to figure out what makes the most sense for her. Many experts think this is a big step in the right direction. Here's Nancy Keating again from Harvard. KEATING: There really is not a single answer to the question, should I have a mammogram? It really involves looking at each patient individually, thinking about their risk of developing breast cancer and thinking about the harms. STEIN: The society is also saying that doctors don't have to bother with physical exams of women's breasts ever year anymore. Mammograms are enough. But not everyone is totally thrilled with the new guidelines. Debra Monticciolo is with the American College of Radiology. She's worried about dropping the recommendation to start screening every year at age 40. DEBRA MONTICCIOLO: I am personally concerned, as a woman and as a person heavily involved in breast cancer screening. There'll be lives that we could save that will be lost. STEIN: And others think the Cancer Society is still pushing mammograms too hard. Fran Visco heads the National Breast Cancer Coalition, a big advocacy group. FRAN VISCO: No matter how they try to slice and dice it, the reality is that mammography screening has minimal benefit, and it has significance cost. I think all the American Cancer Society has done is really add to the confusion without helping women make an informed decision. STEIN: So it's clear the debate about how best to use mammography is far from over. Rob Stein, NPR News. Transcript provided by NPR, Copyright NPR.